*Thanks to Cabot and Vermont Tourism for sponsoring this Woodstock, Vermont travel guide and our trip. All opinions and content are 100% my own. 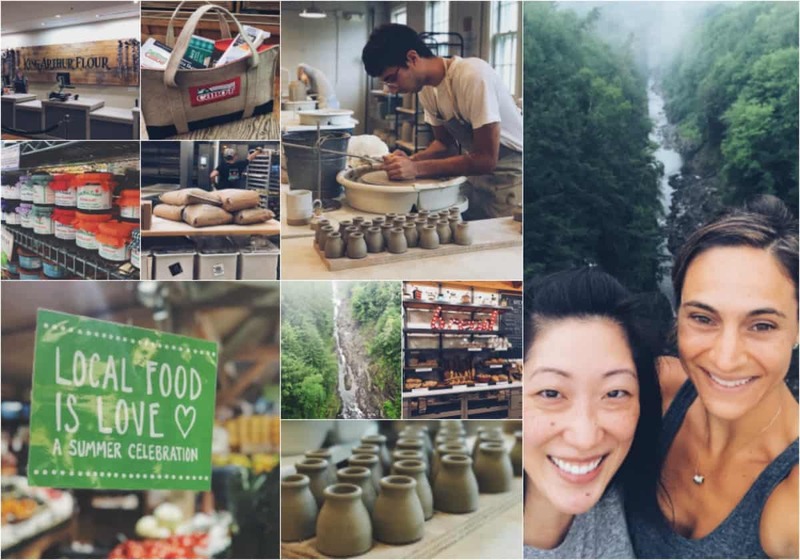 A few weeks ago, Julie (tablefortwoblog.com) and I were given the opportunity to visit Woodstock, VT for a couple days. We were determined to fit in as much as we possibly could during that time because this town (and the surrounding areas) has SO much to offer! Most people probably equate Vermont with winter ski vacations and no doubt, the Green Mountain state definitely has some awesome resorts/mountains for that – I’ve been many times to Mt. Snow, Okemo and Killington and loved every slope I’ve skied down and every trail I’ve snowmobiled on but there’s nothing quite like New England in the summer time. 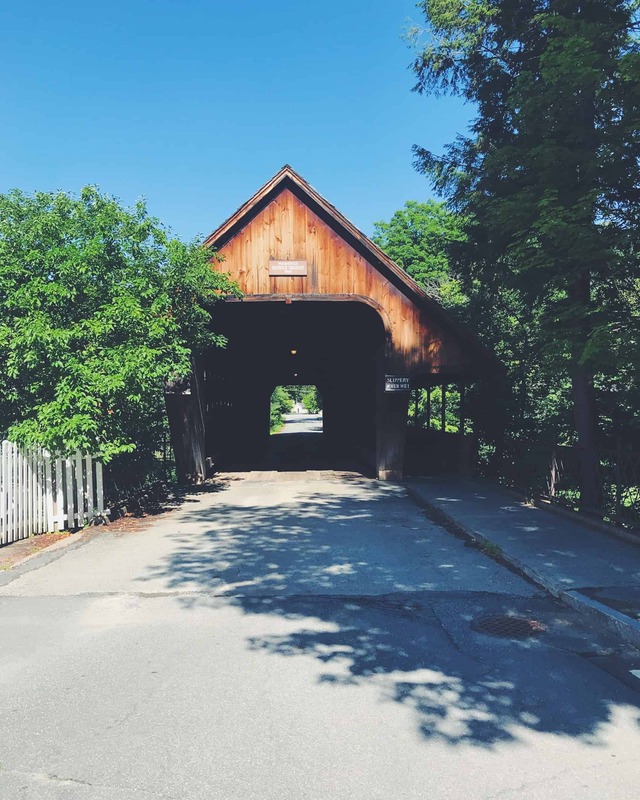 Being in Vermont during the warmer months, you definitely feel an appreciation for the state you don’t quite get in winter with all the greenery and flowers (especially the gorgeous hydrangeas!) in bloom. They bring a whole new feel to the quaint, picturesque small towns dotting the country roads I drove through to get to Woodstock from New York. 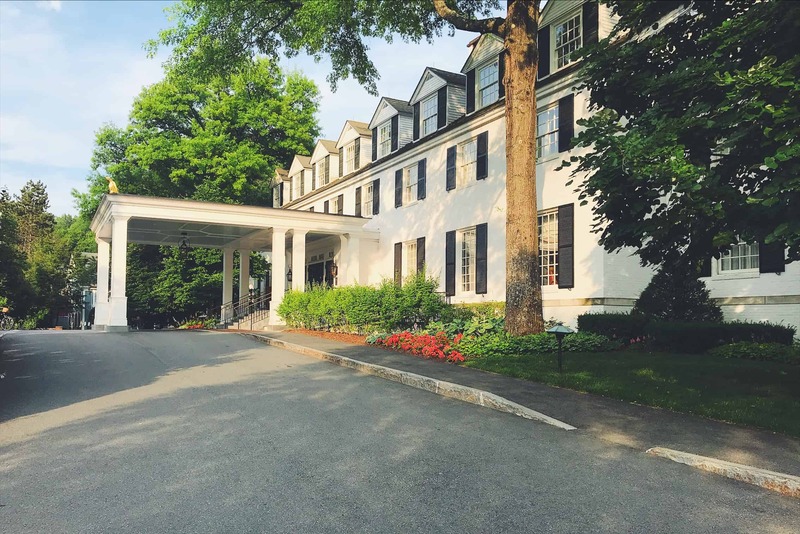 Pulling into the Woodstock Inn & Resort I think I literally said out loud: “well isn’t this quintessential New England!” and if I didn’t, I definitely thought it loudly in my head. It’s exactly what you picture when you think of a Vermont hotel and stepping inside, it did not disappoint. 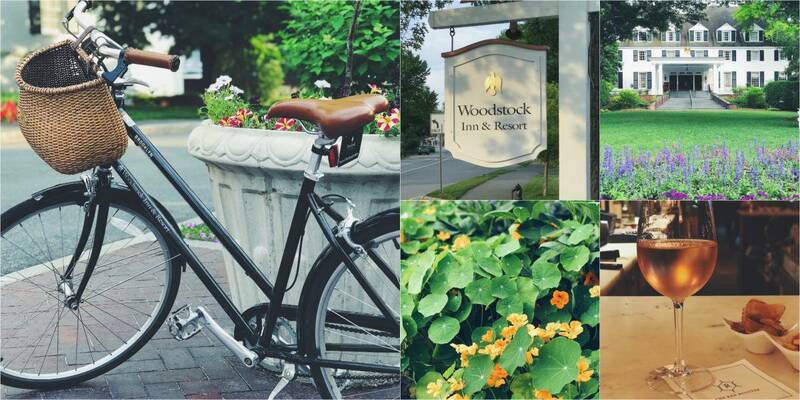 The Woodstock Inn & Resort has all the charm of a cozy bed and breakfast but with the amenities of a luxury hotel. From a great bar and restaurant to an excellent spa and lovely outdoor pool. The grounds are meticulously maintained (everything was showing off for us in full bloom!) and had it not rained almost all day on our full day there, you can bet I would’ve taken one of those adorable bikes out for a spin in town! The beds were heavenly, the bathroom an updated dream with all its white marble and lovely spa toiletries and I was incredibly happy to peacefully enjoy my time in the room soaking up every minute of being away from home and the constant attention a certain 10-month old Weimaraner puppy seems to need. Upon arriving I was starving (what’s new? ), the almost 4 hour car ride gave me plenty of time to work up an appetite. I was directed to the The Village Butcher after talking to a business owner in town because unfortunately, there was a fire in Woodstock that day that had temporarily shut down a lot of businesses on the main street. I had walked by the storefront earlier but didn’t even think to check it out for a late lunch assuming it was just a butcher shop. 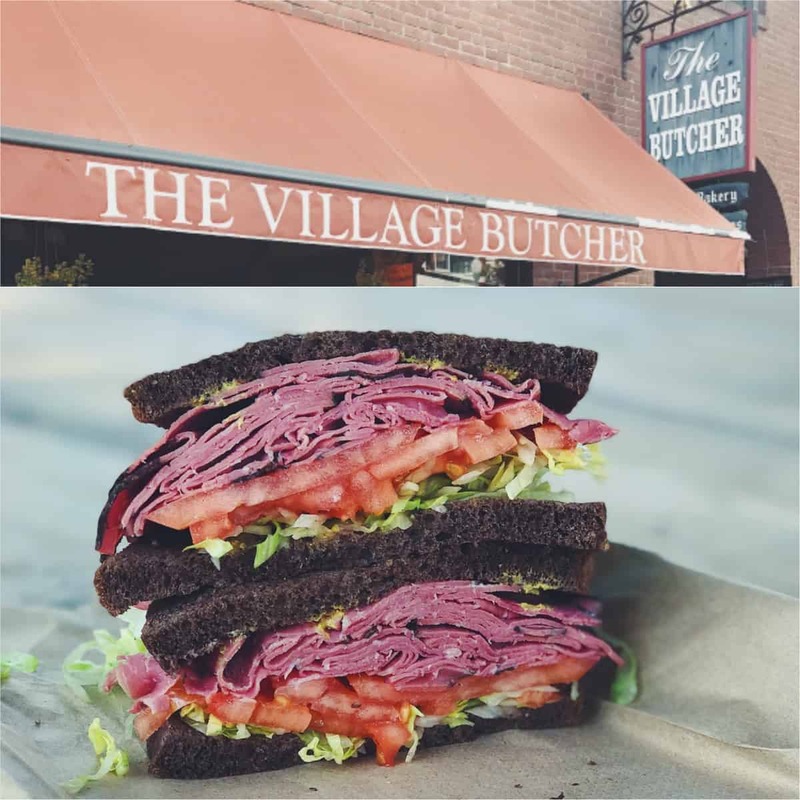 In addition to the amazing looking meat selection (which made me wish I had a full kitchen to whip something up) The Village Butcher has an assortment of sandwich options. It’s hard for me to resist a good pastrami sandwich so that was a no-brainer when I saw it on the menu. Perfect size too (aka: not a NYC size-of-your-head kind of pastrami sandwich) to carry me over until dinner. That first night, we had reservations with the Cabot team and a local farm family who are part of the Cabot Co-operative, The Richardsons, at a highly recommended restaurant, The Prince & The Pauper. The ambience was so on point for cozy Vermont that while it made dinner even better, proved difficult for pictures! So you’ll have to trust me when I say my duck was perfectly cooked and the pot de créme a chocolate lovers dream. 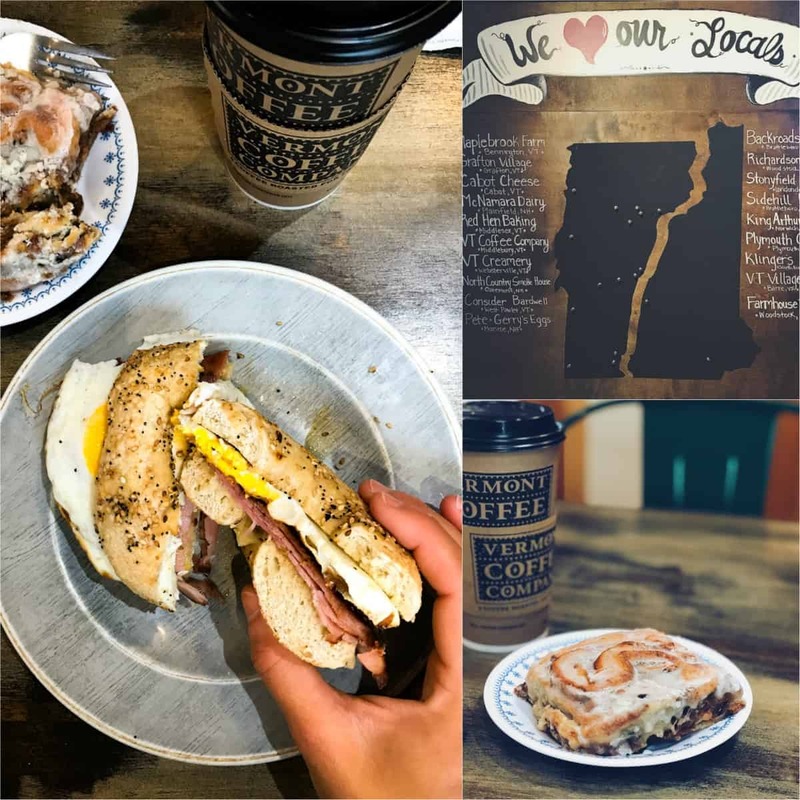 While the Inn’s breakfast looked delicious, we decided to try out Mon Vert Cafe right in town for some much needed coffee and something to eat the next morning and I’m so glad we did! Breakfast was incredibly delicious (mmm, that everything bagel breakfast sandwich with Cabot cheddar!) we ended up coming back the next morning too. That cardamom cinnamon roll was amazing. Throw cardamom in any baked good and I’m a total sucker. I got it to share with Julie and her husband, Jason but pretty sure I ended up eating 80% of that myself. It was undercooked in that perfect moist cinnamon-roll way so that the outside layers were just as good as the cherished middle and just typing this is giving me a major craving for a bite right now! As you can see from the cool wall art, Mon Vert is all about the local love. Their menu is chock full of products from local farms and brands – all the Vermont (and New Hampshire) <3. Something that’s always an issue for me on short trips is feeling like I never got to eat at all the places I wanted to! Between the length and the fact that a few places happened to be closed on Mondays/Tuesdays we ran into that a bit on this trip but make sure to check out these places too if you’re traveling to Woodstock, they all look amazing! Mangalitsa <– really sad we didn’t get to try this one! The White Cottage Snack Bar <—enjoyed a delicious hot fudge Sundae here but they also have a great fried seafood selection. Our full day in Woodstock happened to be a rainy one but we didn’t let that stop our plans to take full advantage of all this charming town had to offer (just maybe not so much the hiking part I had been looking forward to – oh well, next time!). First up was checking out the Woodstock Farmers Market that so many people had told us about. I’m used to outdoor farmers markets but this was in an actual building, sort of like the kind of store you’d see in an orchard/farm but even better because it had local meats, cheeses, flowers, frozen goods, coffee and lots and lots of maple syrup! It was like a foodie’s heaven to peruse the aisles but it made me sad I couldn’t buy up all the delicious looking local produce and eat it! 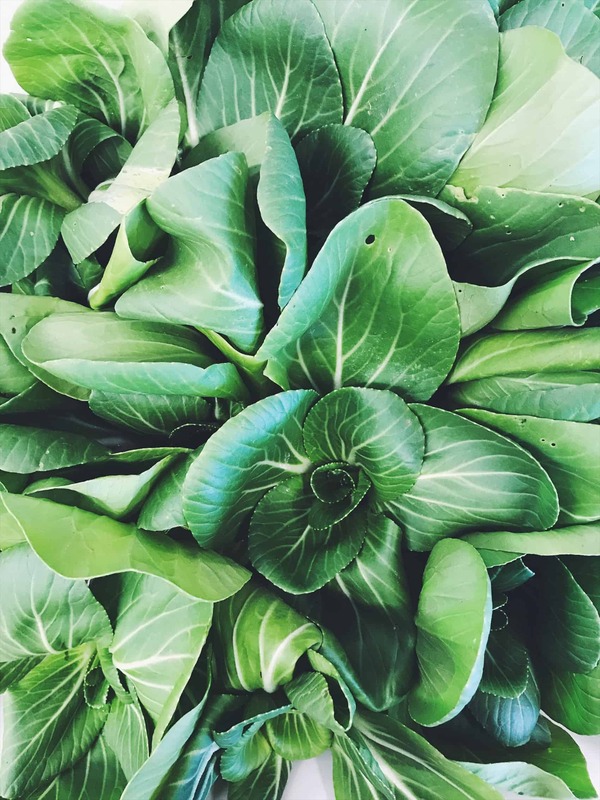 If you’re staying some place with a kitchen, I would highly recommend checking the Farmers Market out, you’ll definitely find some inspiration for cooking a meal there. Next was a trip out to Norwich (about a 20ish minute drive) to visit King Arthur Flour. They have a great store packed with every flour, baking mix and baking accoutrement you can imagine as well as a delicious bakery/cafe that serves breakfast and lunch. Even though we had just had breakfast, we couldn’t pass up trying some of their bakery items so we got 3 cookies to share. The almond cloud cookie was my favorite. If you like almond paste based sweets, this would totally be your jam. It was fun to watch the bakers behind the glass windows doing their thing (they start baking at 3am) and we even spied some Cabot butter being used back there – only the best! On our way back to the Woodstock area from Norwich we stopped in Quechee (after a quick stop at the Quechee Gorge to check out the jaw-dropping view!) to drop in at the Cabot store and load up on some goodies! Cabot was nice enough to gift us some bags to fill with our favorite in-store products. We had fun taste testing some flavors that aren’t as easy to come by at home (hot habanero and the cheese spreads became quick favorites!) and walking around the rest of the country store before we left for our next destination. Farmhouse Pottery is pretty well known in the food blogging world because their pottery is just downright gorgeous in a simplistic way that lets the food shine and looks amazing in food photography. Their building is two-sided: a workshop on the right when you walk in that you’re free to wander through as the artists do their thing and a store on the left that’s just pure goals for all your serving-ware needs in life. I now want to get rid of all my dishes, win the lotto and buy everything from them. I left with a mug (not that I needed another one of those) that makes me way happier than an inanimate object should when I take it out of the cabinet at 6:30am every morning to pour my first cup of coffee for the day. By this time of the day, we had finally worked up an appetite again for some lunch and headed over to Harpoon Brewery in Windsor (about 15 minutes from Woodstock). I’ve been enjoying a lot of their Camp Wannamango this summer and know I like a lot of their beers already but decided to try a new to me seasonal pineapple draft which was delicious. Food was what you’d expect at a brewery – sandwiches, burgers, wings, etc. and we went to town on some delicious onion rings, wings and a shared club sandwich. They were bottling when we walked in and I had hoped to catch a glimpse of more of the behind the scenes operational stuff on our way out but sadly, they seemed to either be done for the day or on a break. Still a fun place to check out, had we not had to get back for other stuff, I could’ve happily sat at the bar for the rest of the rainy afternoon sampling some beers! 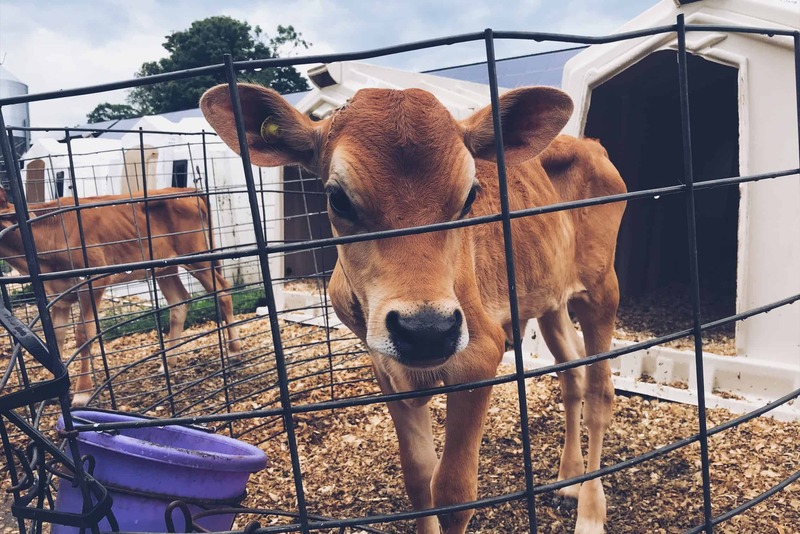 We headed back for a little downtime before meeting up with Jimmy, a Cabot chef to do some cheese tasting at Richardson’s Tavern, the on-site restaurant at the Woodstock Inn & Resort. Jimmy talked us through some different Cabot cheddars. It’s funny because when you eat just one type of cheddar at a time, you might think they all taste the same, cheddar is cheddar essentially. But when you do a taste test of each kind one after the other, you really start to taste and understand the differences. Highlights for me during our fun “cocktail hour” were a new appreciation for the Alpine cheddar (part of the Cabot Legacy collection) – it has a hint of Swiss in there and those awesome granules you associate with parmesan for some added texture and I just fell in love with it! I usually default to the Farmhouse Reserve (like in my recent recipe for Instant Pot Creamy Tomato Tortellini Soup) but I think I have a new favorite! 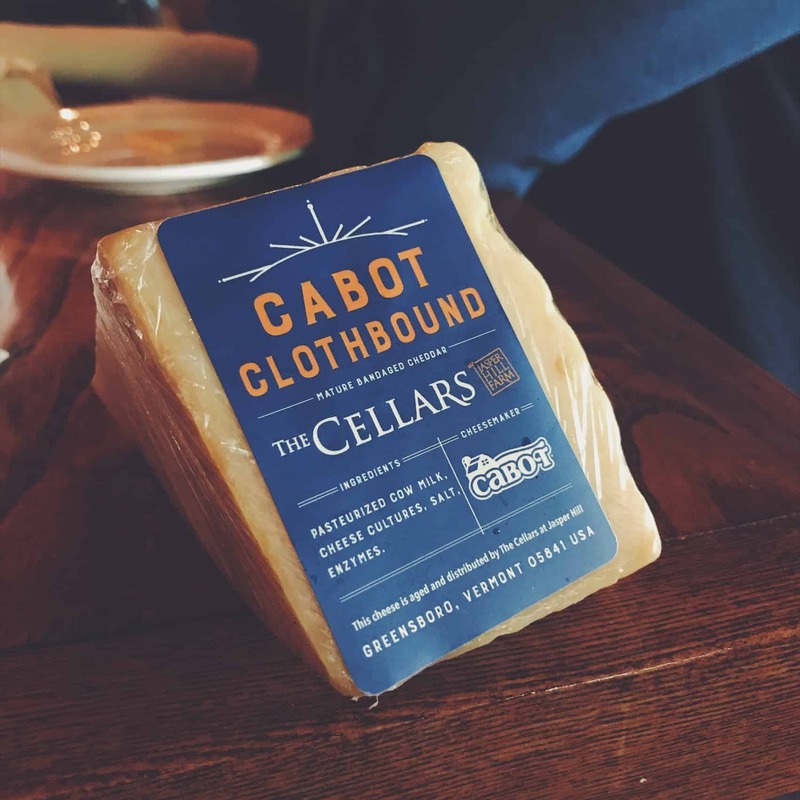 We also got to taste the Cabot clothbound cheese. This one is aged by Jasper Hill Farm and the milk comes exclusively from Kempton’s Farm in VT. Words fail me on how to describe this one but if you ever get the opportunity to taste it, I can’t recommend it enough! It’s unlike any cheddar I’ve ever had and the aging process it goes through sounds reminiscent of what I remember learning about how true parmesan is made in Italy. It’s definitely a special cheese. Another fun fact learned from Jimmy – all Cabot cheddar is lactose free! Fun tidbit if that’s something you need to take into consideration. 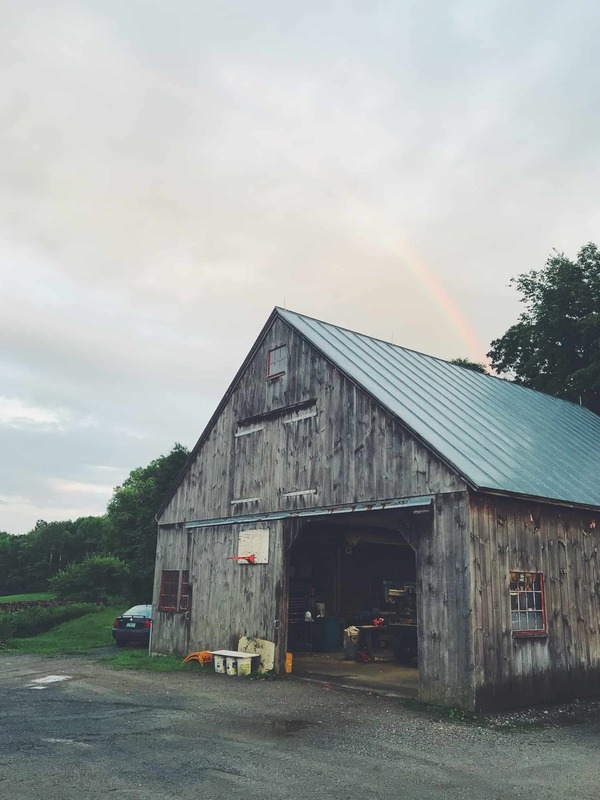 Richardson’s Farm was the last stop of the day and the weather finally let up enough for us to be outside – even gave us a faint rainbow above the barn! I’ve been on quite a few dairy farms (many of them Cabot Co-operative members actually) and seen everything from a 15 cow operation to over 1,000. 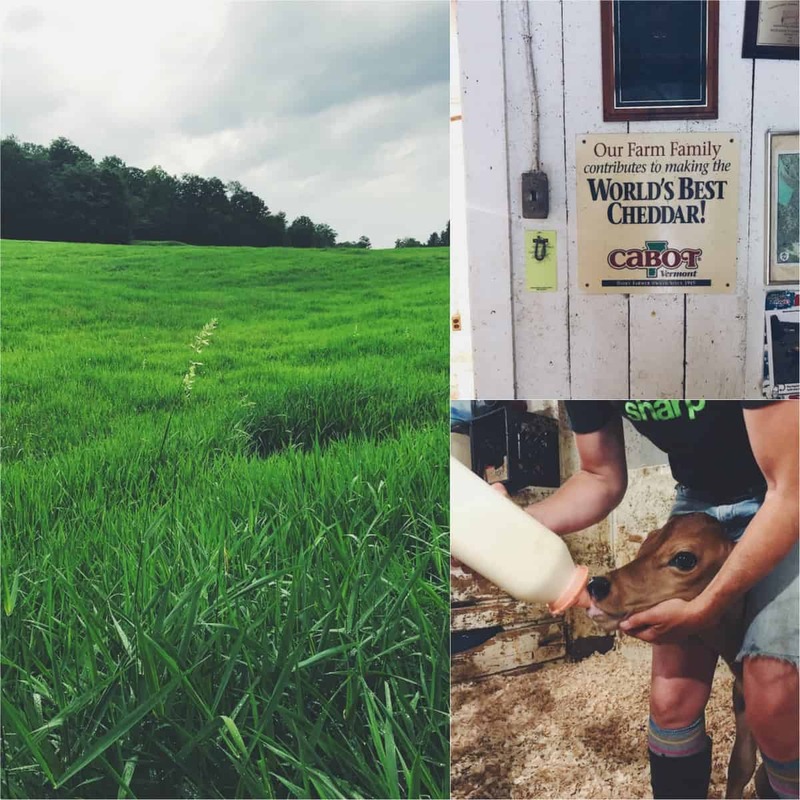 Richardson’s farm is on the smaller side with about 50 milking cows all of whom have the freedom to spend their time at pasture if they want to and the pasture on their farm is beautiful. Like much of the state, their land is acres and acres of gorgeous green rolling hills and I’m sort of envious of the scenery their cows get to take in on a daily basis. We saw all the cute calves (including one just a day old!) and got to watch the evening milking go down while the farm dogs, Ruth & Lark accompanied us looking for any licks of raw milk they could get. 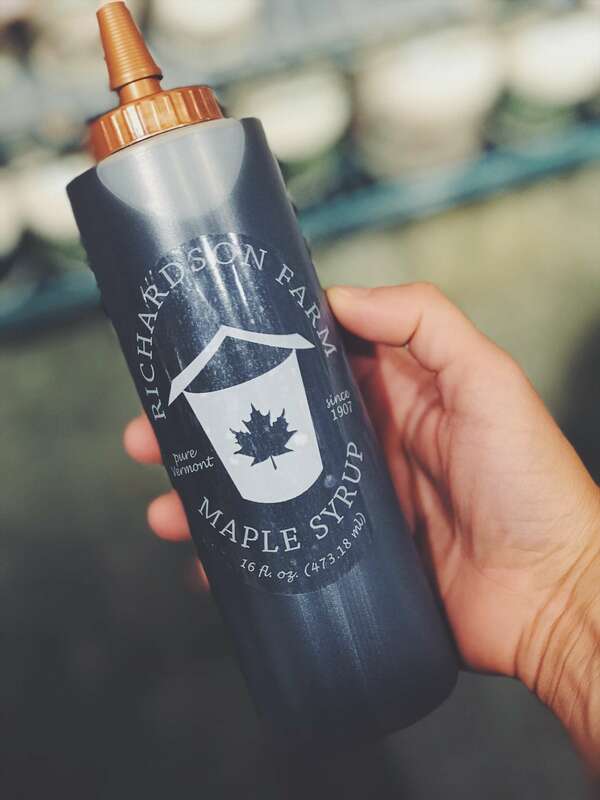 The Richardson’s also make maple syrup on their farm and I have to say, have the BEST idea for packaging I’ve ever seen when it comes to maple syrup- A SQUIRT BOTTLE! I thought this was pure genius. Totally gets rid of the crusty maple syrup top problem. I’m a converted loyal customer for this alone. Still full from our late lunch, we decided to skip dinner and grab some ice cream instead at The White Cottage Snack Bar. I went with a traditional vanilla soft serve hot fudge sundae but Julie had a blueberry crumble hard ice cream made with local berries that looked AMAZING! 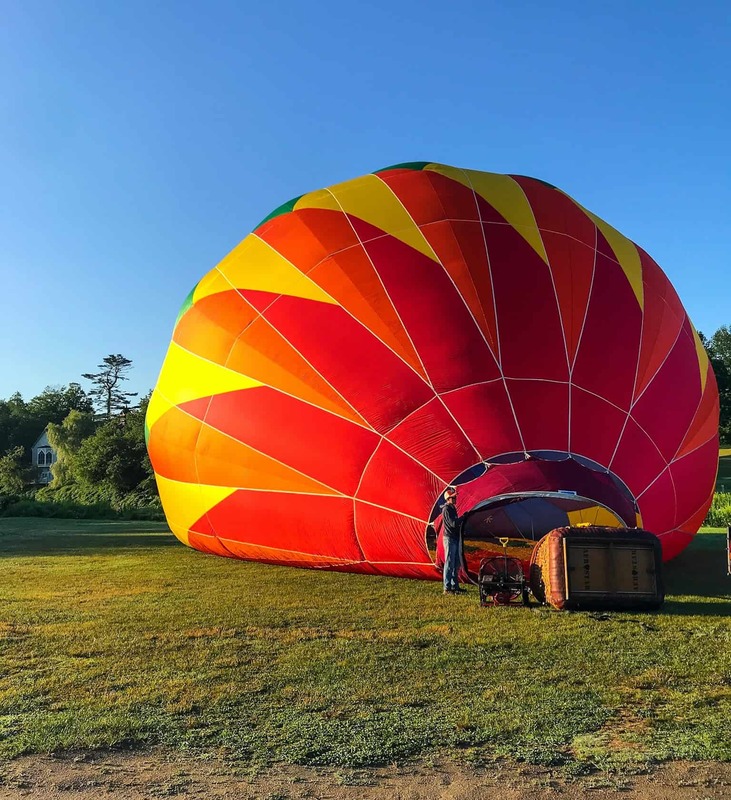 Wednesday more than made up for Tuesday’s weather with completely clear skies, low humidity and the go ahead for our hot air balloon ride with Quechee Balloon Rides. I’ve been wanting to do a hot air balloon ride for years. Ulysses is a bore though and refuses so when I heard this was a possibility for the trip, I was so excited! The company owner, Chris was so knowledgeable – I had no idea how much weather knowledge you needed to fly one of these things. I mean, it makes sense now that I think about it but at the time I was thoroughly impressed by his scientific level understanding of wind patterns, etc. I guess when you have no steering that many feet in the air, you kinda gotta know your stuff? 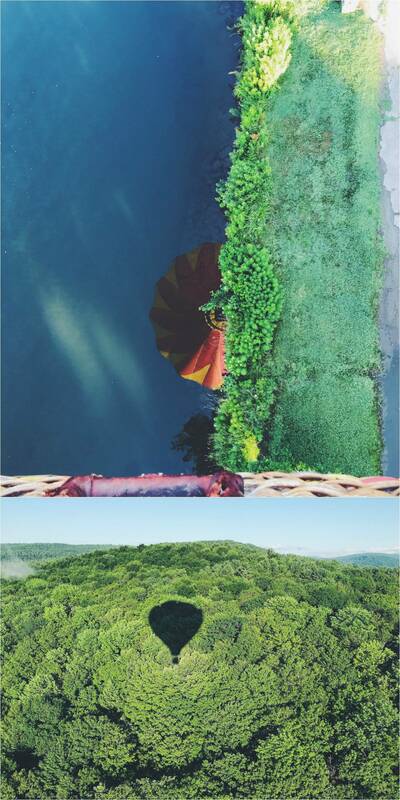 We flew over Quechee Gorge which was cool to see from a totally different perspective than the day before, saw wildlife crossing the river and were chased by barking farm dogs not so sure about us in our big “carrot” balloon. We had what was called a “hard landing” in a random farmer’s hay field and while I can see it maybe being a little bit much for an older clientele, I think it totally added to the fun of the experience having to traipse out of a 5-foot high wet hay field. Chris’s mom and dad were our chase team and we ended the whole experience with homemade freshly baked local blueberry muffins and some mimosas, not a bad start to the day and end to our trip. After another delicious breakfast at Mon Vert Cafe, we checked out and I headed home back to New York thinking to myself how weird it is that we can be neighboring states yet feel so different. Vermont has a special vibe about it – it’s a bit hipster and way more laid back than NY, almost like California but with this local, Paul Bunyan lumberjack vibe. I’m so glad I got to explore a small piece of it in Woodstock. I loved Vermont when I visited last fall, but we didn’t get to go to Woodstock, and it’s definitely on my list. Great post!! Thanks for coming to visit our neck of the woods and doing such a wonderful job highlighting all the great places to visit and things to do in our area. Next time you are up this way, make sure to make a reservation early for Mangalitsa, it is a wonderful restaurant. My husband and I supply them with most of their summer vegetables. You can also check out our farm and cabins. Check out our website if you get a chance. Our farm is called Fat Sheep Farm & Cabins and we are located in Hartland, Vermont just 11 miles south of Woodstock. We have over 95 five star TripAdvisor reviews. You have a lovely website! We really wanted to try Mangalitsa but they were closed both days we were there unfortunately! Thanks for your comment, hope to visit again in the near future and will be sure to check out your site! So glad you enjoyed your stay in Vermont. It is one of my favorite vacation locations. We typically stay in Chester, Vermont which is not that far from Wood stock. The next time you go I would like to suggest that you visit Simon Pearce. I so enjoy watching the glass blowing, I really cannot afford any of the pieces other than seconds.